Sydney has been having a big problem with oversized trucks driving into tunnels that are too low. So Sydney needed a stop sign that is absolutely impossible to miss. Here it is and it's amazing. 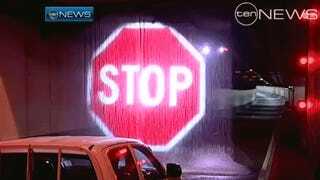 It's a curtain of water with a stop sign projected onto it. You can have as many overhead stop signs as you want, but as this 10 News video report shows, truck drivers still crash their trucks into these low-overhead tunnels. Sydney was tired of the delays, the costs of the damages, and the threat that a truck crash would get someone killed. That's why in 2007 they put in this water curtain sign on its harbor tunnel, designed by light show company Laservision. They work brilliantly. Here's the whole news clip.